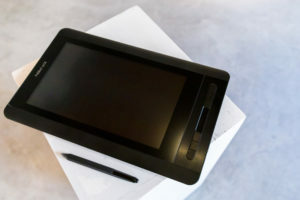 This is the third XP-PEN device that I own, so I can tell you generally what I think of their products and why the Artist 12 is a step ahead. I own the Artist 10S and the Artist 22E and I love both of those devices, but the one drawback of the 10S was that it had a 1368 x 768 resolution. That’s perfect for a 10 inch screen, but it is not so great for real-estate for photoshop. This 12 inch model with its 1920×1080 screen fixes that, with a very similar form factor to the 10S. 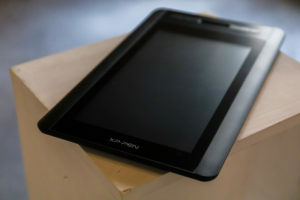 Why do I say it’s a good travel tablet? It comes with a cool carry case for the pen (a cyllindrical tube) and it fits perfectly inside a laptop case, sitting on top of a 15.6″ laptop. The cables have been reduces since the release of the early models, and now instead of two cables (USB Power and USB Data) like on the 10S, the Artist 12 uses one USB cable (and it’s a right angled cable which helps in taking up less space and protecting the cable itself). The design is sleek and simple while not feeling light or flimsy. It’s a solid design as I’ve come to expect from XP-PEN. Their designs don’t seek to be the easily breakable full glass interface of other manufacturers but sturdy devices that just work. The pen, with it’s multi-sided shape (it’s not a cyllinder) feels good in the hand whereas other cyllindrical pens tended to rotate, meaning that using the buttons on the barrel became difficult because they weren’t where they are supposed to be. I didn’t think that I would need anymore than 2048 levels of sensitivity for the retouching work I do as a photographer, but when I was testing out the Artist 12’s 8192 levels I was astounded at just how lightly or heavily I could press without the reaching the limits of the sensitivity. In fact, it’s worth tweaking those for the work that you do. 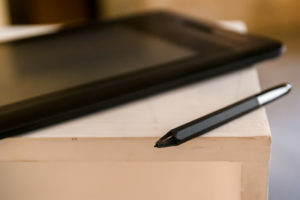 Some designers and drawers will like to have the extra light touch available to them, while working in photoshop and on photos, sometimes a low sensitivity doesn’t make a noticeable difference to brushstrokes. 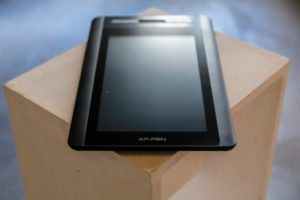 In the end, this is the third device that I own by XP-Pen, after the 22 inch and 10 inch version. I’ve since given my 10 inch version to a friend, because the Artist 12 has replaced it WITHOUT adding anything major in terms of dimensions. I regularly recommend these to artist friends who may not be in a position to spend 4x as much on a Cintiq or similar device. The Artist 12 doesn’t come with a felt carrying case like the artist 10S did, which is a shame for those of us how use it as the travelling option to the larger screen of the 22E. The cables, being long, work really well in the studio environment as you leave them connected (and there is only one attachment at the tablet side, so it doesn’t make much mess) but they’re a little too long for portable tablet use where you might need a power cable that is 1-2m most, and a data cable that is just 1m. That’s just my con in terms of using it as a tablet while I’m away from the studio, but even selling a shorter version of the cables might be a good solution for XP-PEN in the future.